Do you remember Willie Wonka and his Everlasting Gobstoppers? Well, I’ve got the propane tank equivalent. We last traded out the propane tank in September – nearly 11 months ago. Granted, we didn’t use it prodigiously throughout the winter (it was freaking cold this year – even if you did live in Florida), but the thing has been near-empty for the last two months. Every time I use it, I assume I’ll have to finish the dinner in the oven when the tank fizzles. But it just keeps going and going (Maybe the Blue Rhino is somehow related to the Energizer Bunny). I know, I know: we should just pick up a spare tank. I just can’t bring myself to spend an additional 50 bucks for a second tank when we can trade in the empty for $20 (and heaven forbid we trade the tank before it’s empty). So I just keep playing Russian Roulette every time I decide to grill. This week, I finally decided to dare the thing to run out – I invited some friends over and planned on grilling. I figured that meant it would poop out about 5 minutes into preheating. Then I could finally get some peace of mind, and trade out this possessed propane tank. I fumbled through the freezer and realized I still had some pork sirloin steaks that I’d picked up a little while back. Now I like the flavor of pork sirloin, but I don’t think it’s a particularly pretty piece of meat – to me, it always looks like it’s been cobbled together. Like I said, its saving grace is that it tastes great, and it holds up well to marinating, so that’s what I decided to do. This marinade is just a quick and simple amalgam of my favorite Asian flavors: sweet, savory, salty, and spicy. A little bit of ginger, some scallions, garlic, pineapple, and of course, soy sauce. The best thing about marinades is that the meat just sits around in it until you get ready to cook. There’s no schedule to keep. And I tend to not use the exact same ingredients for a marinade twice – I just improvise with what I have on-hand. It’s just less stressful, and saves on last-minute trips to the grocery store too. Since I was tempting the grilling fates, I decided to throw some broccoli on the grill as well. I mean, if the dinner was going to go down in flames (instead of up in flames – HA! Get it? It’s a grill…), then I figured I might as well send it all down together. The broccoli just got a simple dressing of olive oil, salt, pepper, and a pinch of red pepper flakes. Then, of course, you can’t have an Asian-inspired meal without white rice. And I figured that using the side-burner on the grill would surely squelch that blasted propane tank, so on it went. Just a little chicken stock and some additional soy sauce is what I used to steep the rice. It turns out looking like brown rice, but it tastes good, so who cares? The grill heated up, the food went on, and I waited for the inevitable flame-out. And I waited. Then the food came off, and the grill was still going. So I finally relented and turned off the grill, defeated once again. I don’t know, maybe I shouldn’t be so obsessed with the capacity of this propane tank. Or maybe I should just start looking for Oompa Loompas in the backyard. Place the pineapple, ginger, garlic, red pepper flakes, vegetable oil, soy sauce, and sesame oil into the bowl of a food processor and pulse until smooth. Pour the marinade into a large resealable storage bag (I use the gallon size). Add scallions and pork sirloin. Seal the bag and massage pork until coated with the marinade. Place the storage bag into the fridge and marinate for 1-2 hours. (Turn the bag over every 30 or 45 minutes to ensure even distribution of the marinade). Remove the bagged pork from the refrigerator about 20 minutes before you intend to cook it. Preheat your grill (or grill pan) to medium heat. Remove pork from marinade and gently shake off the excess marinade. Grill for about 10 minutes on the first side. Flip. Grill 8—10 minutes on the second side, until the pork is cooked through. Remove from grill and let rest for 5-10 minutes before carving. 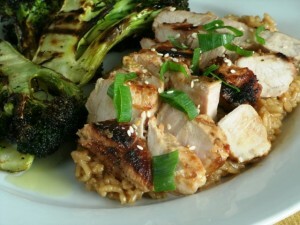 This entry was posted in Cooking and tagged asian, dinner, pork. Bookmark the permalink.